This fall, HACC, Central Pennsylvania’s Community College, began offering a fully online two-year associate degree in building construction management that prepares students for the growing demand in construction careers. HACC is one of the only schools in the nation to offer this program fully online. In addition, it is the only community college in Pennsylvania to provide the opportunity to complete the program online in two years. “Word is getting out and we have fielded inquiries from Western Pennsylvania and the D.C. metropolitan area. Construction companies in Central Pennsylvania have been inquiring about the Building Construction Management (BCM) Program as it is a good fit for their tradesmen who wish to move into construction management areas,” said Kazim Dharsi, senior professor of architecture and architecture technology at HACC’s Midtown Trade and Technology Center. According to the Associated General Contractors of America (AGC), construction employment has steadily increased to its highest level since 2009 and should continue. PayScale.com data for 2015-16 indicates that an associate degree in construction management is one of the highest earning two-year degrees. 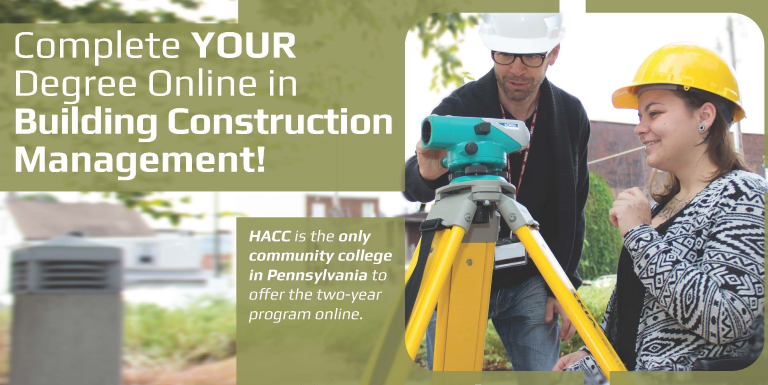 HACC’s online BCM Program gives students the tools to succeed in this growing field and teaches them how to manage the construction process from start to finish, estimate quantities and costs for a project, interpret construction documents and building codes, apply principles of construction accounting, and more. A background in construction is helpful but not necessary. The program is designed to be flexible enough so students can transfer credits to a wide variety of colleges and universities with no loss of credit. Students may also pursue a bachelor’s degree in technical leadership through HACC’s articulation agreement with Bloomsburg University. At its Midtown Trade and Technology Center, HACC offers a dynamic hub of trade and technical training programs that lead to in-demand jobs sought by 21st century employers. Students find top quality, hands-on training in innovative environments; replicate real-life and on-the-job experiences in the classroom; and learn the skills needed to succeed as they build a career.